How many of you would think that buying insurance is a hassle? With so many insurance products to choose from, how do we know which is more suitable for us? Did you know that most people actually end up overpaying for insurance and under cover themselves? Most of us young people when we just enter the workforce, we will be clueless on which insurance to buy to protect ourselves. A lot of us later realised that we bought the wrong insurance and could not change it any more because there would be penalties imposed. How about when you have a new born baby? We know that insurance is important for our child's future but do we really know which one to buy for them? Even if we do know a bit, most of us would not have the time to look through every package that's available in the market and choose the best insurance policy out there. Is there an easier way to this? 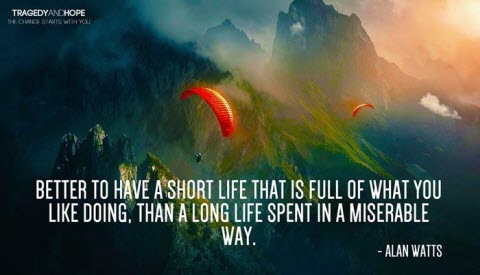 Yes there is an easier way. In this era of information technology, everything is going online. This includes insurance. We can go online to shop and compare the best prices for our clothes and even services, we can go online to compare housing prices, car prices, air ticket prices and tour packages. Did you know we can also go online to compare insurance products and their prices? When I was just entering the workforce, I somehow knew that insurance was important but didn't know which insurance is more suitable for me. When I was approached by a financial advisor from a particular company, I always didn't buy any insurance products even after hearing them talk for the past few hours. In my mind, I always think there would be better and more value for money insurance policies from other insurance companies. I wanted to compare the prices and see which is better. 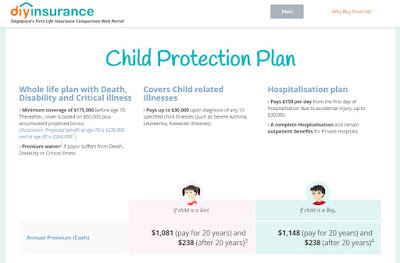 Thankfully, the Monetary Authority of Singapore (MAS) launched its own insurance comparison portal called compareFIRST which allows us to compare the different insurance products of different companies. 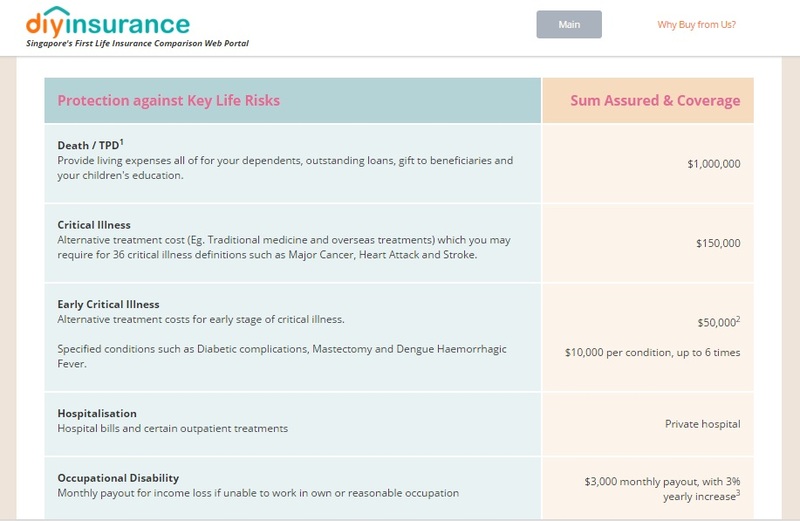 It is similar to DIYInsurance web portal which also offers comparison features. 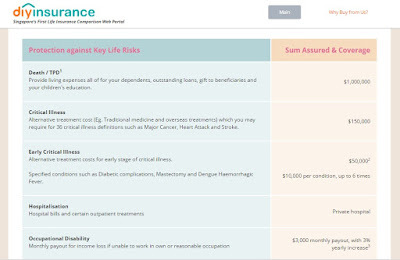 DIYInsurance is the 1st Life Insurance comparison web portal in Singapore. Previously, I wrote a post on Do You Really Need A Financial Advisor?. 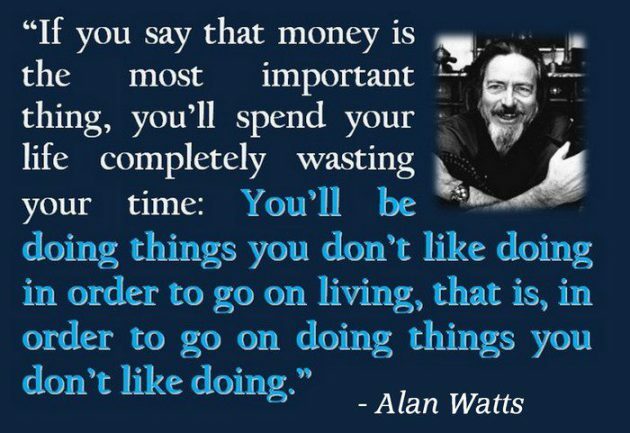 This post attracted quite a lot of views where I wrote about my experiences with financial advisers. Some were good while some not so good. It is really hard to know which advisers are good thus insurance comparison portals does help in this. DIYInsurance is not only a comparison web portal but they are genuine in providing the best service to the consumers. They recently launched 2 new insurance packages namely the Young Working Adult and Baby Package. Now listen carefully, here's what they did which makes these packages so unique. Firstly, they understand the needs of what we need as a young working adult or when we have a newborn child. They put together a combination of policies, compared against different insurance companies, to bring us the best price we can get. Now, we don't have to think hard on what insurance policies or even compare which policy from which company is better. All these has been done for us. Its easy, just pick one package and go. We can buy different insurance policies from different companies all through them without having to approach individual advisor of different companies. I went to their website, took a good look at the packages and can't help but feel that they really put in a lot of work in putting together the packages. Let's start with the Baby Package. They have 2 different packages in the baby package category. One is the Child protection plan and the other is the education savings plan. 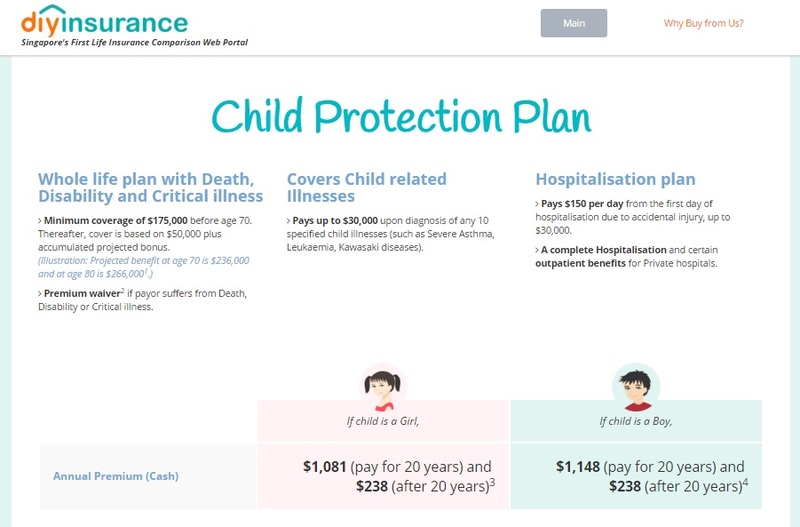 The child protection plan includes a life insurance cover of $175,000, a critical illness cover of $30,000 and also a hospitalisation plan. 3 different coverage all for an annual premium of only slightly above $1K. For the education plan, it is a customizable plan to give your child cash payouts at different stages of their lives in the future. Total payouts are as high as $56,921 when your child is age 18-22. This is quite a good sum of money for your child's education in the future. 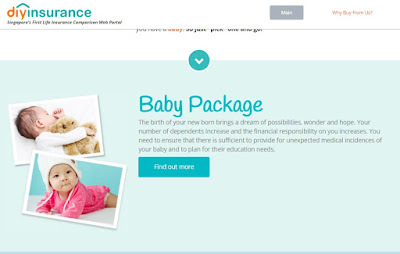 They are also giving commission rebates and $50 worth of shopping vouchers when you purchase a baby package from them. You can refer to this link, Baby package, for more information. 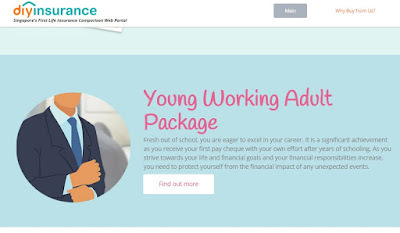 In the Young Working Adult package category, they put together a comprehensive package which covers 5 different areas of our lives. I was actually quite amazed when I see the coverage vs the premiums payable. I've researched on insurance products and prices for quite awhile now and this package that they put together is definitely at its best value. All these for a premium of only $220 per month if you're 25 years old currently. 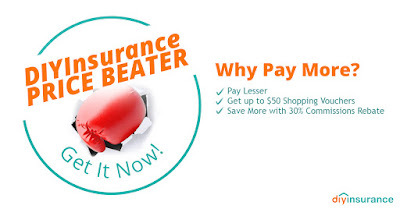 What's more, you'll receive $350 from them upon taking up this package as a form of commission rebate which DIYInsurance has been giving to its clients for the longest time now. You can refer to this link, Young Working Adult Package, for more information. Have you heard of price beat guarantee from other companies before? DIYInsurance launched its very own price beater to offer you a lower price than what you were offered out there. Now, we don't have to worry about over paying for insurance. DIYInsurance will help you review the insurance policy quotes you receive from other insurance companies and offer you a better one. 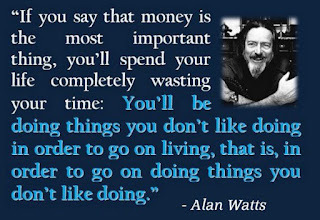 This is definitely beneficial to consumers like us. We get the best price for our insurance needs. Check out their website and get the best value for your insurance policies today! This is a sponsored post by DIYInsurance. Just after less than 1 week of posting on the possibility of Saizen Reit being acquired by another firm on my blog, the news is confirmed!! Existing shareholders of Saizen Reit would be happy hearing this news. Saizen Reit has been a good investment for me for the past 2 years. It is sad to bid goodbye to this stable income producing investment. Saizen REIT, has on 31 October 2015 accepted an offer (the “Offer”) for the acquisition of all the real estate assets (the “Properties”) in Saizen REIT’s portfolio in Japan by Triangle TMK for an agreed purchase consideration of JPY44,660.0 million (S$517.3 million) Triangle TMK is a Japanese affiliate of Lone Star Real Estate Fund IV and Lone Star Funds. The Purchase Consideration is at a 3.4% premium to the appraised value of the Properties. volume-weighted average price per Unit as of 22 October 2015." The offer price to me is quite reasonable at $1.172 as its a premium to its NAV. I think this exceeds the expectation of many existing shareholders. Its a 30% rise above the closing price of 92 cents last week before trading halted. Looking back, I've written a series of articles on Saizen Reit which affirmed my decision to invest in the Japanese real estate market. 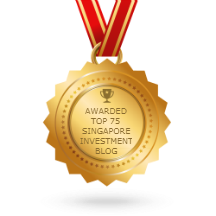 Saizen Reit is the largest investment I have in my portfolio. With this gone, I'll have more cash to deploy to the next best investment in search for better dividend income. Congratulations to all existing shareholders of Saizen Reit! 1. 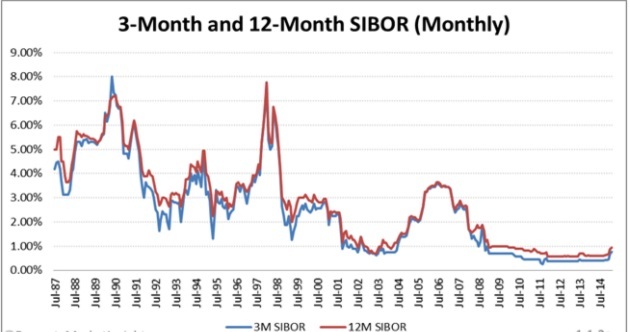 Saizen REIT - Income from Japanese residential properties?